This line forms the southern part of the Oxford, Worcester and Wolverhampton Railway (OWWR) (for a description of more of this railway see the line from Worcester to Birmingham Snow Hill). The first part to open was the short stretch from a temporary terminus in Worcester to Norton Junction and Abbotswood Junction on 5th October 1850. Norton Junction to Evesham opened on 1st May 1852 and Evesham to Wolvercot Junction (Oxford) opened on 4th June 1853. Worcester Shrub Hill Station was opened by the OWWR in 1852 but the OWWR lasted only until 1st July 1860 when it joined with the Worcester and Hereford Railway and the Newport, Abergavenny & Hereford Railway to form the West Midland Railway Company, itself becoming part of the Great Western Railway on 1st August 1863. An interesting feature of the early operation of the OWWR was the running of through trains from Euston via Bletchley to Worcester and Wolverhampton. The first stations on the Oxford line were Norton Halt and Stoulton (both closed 3rd January 1966) before the line reached Pershore. From Pershore the line goes to Wyre Halt and Fladbury (both closed 3rd January 1966) (which had a long siding known as Bomfords Siding) past Charlton Sidings and on to Evesham. Beyond Evesham the line passed Aldington Sidings before the next station at Littleton & Badsey (closed 3rd January 1966) and Honeybourne Junction where it interchanged with the GWR's own line from Birmingham to Bristol via Stratford-on-Avon. The line then passes into Gloucestershire and on to Oxford. In 1971 the track layout between Evesham and Moreton-in-Marsh and Ascott-under-Wychwood to Charlbury was reduced to single track. The disastrous effect of the track reduction can be seen in the timetable above. At this level of service it was no surprise that speculation was rife that it was probably as part of a strategy that would have seen the whole line from Worcester to Oxford closed. In his excellent article 'A question on grant-aid' (Modern Railways, January 1973) John Boynton describes the local service as "a fossilised remnant, remarkable in that it still exists at all". Boynton was not alone in "sensing something faintly sinister" about the level of service and lack-lustre running times as such was the concern of users at this situation that the Cotswold Line Promotion Group, an entirely voluntary organisation, was formed, on 11th March 1978, with the aim of safeguarding and promoting improvements to rail and bus feeder services along the Oxford-Worcester line. 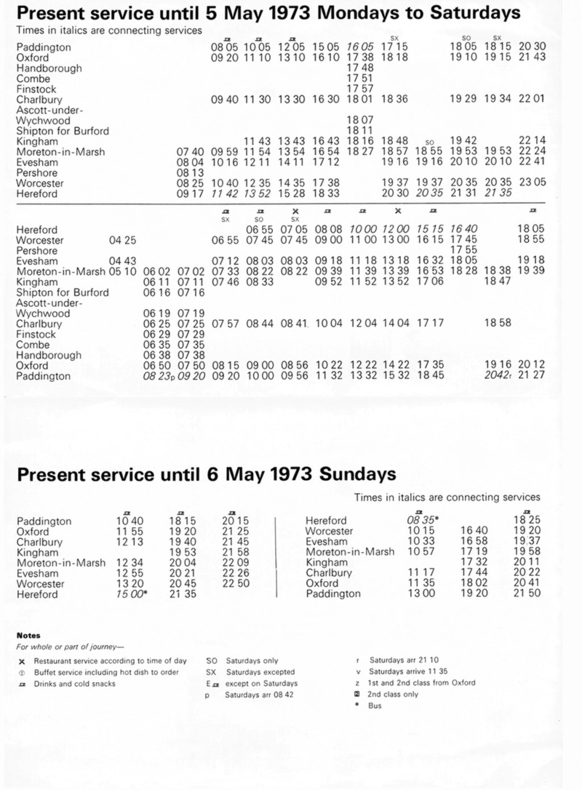 In 1986, the Group's activities were extended to include the Worcester to Hereford line. It considers that a mixture of through and local services is essential to the very future of the railway. The Group has worked to increase use of both lines so that no further downgrading or, ultimately closure, would occur. A phased programme from the summer of 2009 to 21st August 2011 saw the reinstatement of some, but not all of the double track between Worcester and Oxford.